UNITED NATIONS, January 11 -- What is the place of human right at the UN Development Program? Thursday Inner City Press asked Peggy Hicks of Human Rights Watch, offering the example of UNDP helping Uzbekistan's Karimov regime to collect taxes, organizing a National Commission on Human Rights in Zimbabwe which is controlled by Robert Mugabe and boycotted by non-governmental organizations, and having funded "voluntary" disarmament in Karamoja in Uganda, which devolved into the torching of villages and killing of civilians. Uzbekistan, Zimbabwe and Karamoja are all named as hotspots of rights violation in HRW's World Report 2007, in which Ms. Hicks has a chapter on human rights and the UN. Ms. Hicks replied that there is a long road to go, to "mainstream" human rights within not only the UN but also its funds, agencies and programs, specifically UNDP. She said that more than is the case as present, the UN's human rights units need to have prominent places in country teams and to be listened to by UNDP resident representative at the country level. She suggested that Ban Ki-moon begin to judge and evaluate the performance of existing senior UN officials on human rights. How would Messrs. Dervis and Melkert fare? Or, for the Uzbekistan and Zimbabwe examples , Messrs. Fikret Akcura and Agostinho Zacarias, respectively? More to follow. 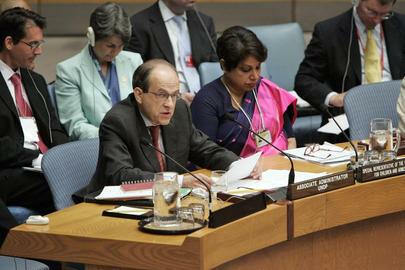 Ad Melkert: have human rights been "mainstreamed" from the UN to UNDP? On the other hand, and in fairness, UNDP co-sponsored an interesting forum on Wednesday afternoon, entitled "Legal Empowerment of the Poor: From Concept to Action." Surprising for an event involving UNDP, at least two of the speakers were openly critical or questioning of the UN system. Ashraf Ghani said that during his time as Minister of Finance for Afghanistan, his "biggest problem was the lack of transparency" of UN agencies in Afghanistan, which included and includes UNDP. He recounted who he was given a single page to show how much money was spent. Sheela Patel, the founder of Slum Dwellers International, said that "UNDP is very, very behind in looking at the urbanization agenda." To their credit, the questioners who followed, nearly all of them UNDP staff, including an ex-resident representative from Ghana and also a staffer who'd worked on women and development in Central Asia, rather than get defensive, mused about the implications of Mr. Ghani's critique. One of the questioners called the implications radical. Well, yes. In any event it focused attention on the plight of the poor, and was more than propaganda. We try to give credit where it's due. An aside we can't resist, about the Human Rights Watch report. It covers 70 countries. Inner City Press asked why, for example, neither the Central African Republic nor Somalia were included. Ms. Hicks responded that it came down to deciding where to spend HRW's resources, with the criteria involving where reporting can bring about change, and where there are governments and decision-makers willing to listen. It's sad that Somalia, earlier in 2006, did not pass this test. It is also unfortunate because many people take these HRW World Reports as listings of the worst human rights hotspots on the planet. If the standard is really about ease of impact, controlled by places that opinion-makers and funders would rebel against excluding (North Korea, Darfur, Belarus), that should perhaps be disclosed more prominently. That said, the 556-page volume is very much of use, and this year's critique of the EU and of the UN (in writing) and UNDP (orally) were much needed. Jose Antonio Ocampo answered that countries run their money through the UN, often to hire their own nationals, "because they can achieve something purpose they want to achieve." Video here, from Minute 52:34. Obviously. But what might these purposes be? A case into which Inner City Press has been inquiring involves Italy funding UNDP in Somalia, in order to place Italian intelligence agents there to monitor Italy's economic interests in the country. Inner City Press has asked UNDP to describe these operations in Somalia and the nationalities of the non-Somalis hired. UNDP has refused to provide this information. A month ago, Inner City Press asked UNDP for information about various of its trust funds. Neither has this information been provided. UNDP/Australia Trust Fund for Fiscal and Monetary Management Reform and Statistical Improvement, Phase II -- it was one of these trust funds for improvement of statistics and reporting, funded by the UK, which has been put into jeopardy by Nora Lustig's blow-up, in front of a visitor from the UK's DIFID, at a staffer seconded by the UK. There is the Trust Fund for UNDP History Project -- presumably the book on which UNDP spend over $500,000, "UNDP: A Better Way?" EEC Trust Fund for Partnership for the Future - Cyprus (note that UNDP's UNOPS is embroiled in controversy for funding propaganda to promote "the Annan plan" for Cyprus); etc. And this is not even considering UNDP's "sub-trust funds," into which we will inquire in future installments. While UNDP has, with the single exception of UNDP's Global Environmental Facility's Goa junket, refused to answer any of Inner City Press' questions for the past month, Wednesday evening the UN Counselor of a UNDP-donor nations offered a different perspective on UNDP's resistance to providing copies of internal audits not only to the press, but even to member states. 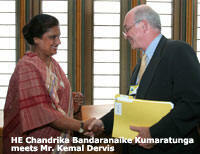 The Counselor speculated that UNDP wants to protect the details of its relationships with host countries. The Counselor and his Ambassador expressed ambivalence about UNDP's standardless embrace of repressive regimes in such countries as Uzbekistan, Zimbabwe and North Korea (these were this country's examples). On the other hand there might be reasons to engage with dictatorships. But if UNDP refuses to provide any information or to answer any questions (unlike, as today's example, UNHCR, click here to view), it is impossible to make or report UNDP's case for what it does and doesn't do. Here's hoping for some much-delayed responses to long-ago requested information, some as simple as UNDP's agreements with nations, which are explicitly supposed to be public. Dear Mr. Lee -- As a former DESA staff member, I would like to thank you for your coverage of the United Nations. There is another other matter on which I would like to draw your attention -- the Department of Economic and Social Affairs. UN staff members have watched with interest the recent news coverage of Mr. Guido Bertucci and allegations of mismanagement, abuse of power, and favoritism/retaliation which have characterized his career with the UN, and more recently his service to the Organization as Director of the Division for Public Administration and Development Management, DPADM. Some news stories have covered specific instances of favoritism and abuse of power, particularly the case of the consultant who received an obscene amount of money for providing functions which are already within the capacity of UN/DPADM or DPI staff, and then tried to cover it up by doctoring her website. The cardinal rule concerning the award of consulting contracts is that no contract may be awarded for a function which already exists among the staff. A more complete examination, whether it be by the media or by OIOS, will find that many of the so-called consultancy contracts awarded by Bertucci were to his friends or associates, and that more alarmingly, in many cases the Organization received no tangible benefit -- no reports, no services -- just money, for nothing more than attendance at this conference or that workshop. I want to encourage you to spend some time soliciting the input of current and former staff of DESA/DPADM, and in particular those of us who have worked hard to survive under the Bertucci Regime. Without too much difficulty, you will find that we fear retaliation because Bertucci has threatened retaliation. 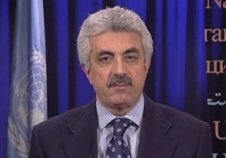 You will find that in general, we are pleased with recent media coverage of DESA because we know that it will be in the best interest of the United Nations and for DESA that the new Secretary-General is informed of Bertucci's activities, and has the opportunity to put a new leadership team in place to restore the credibility which has been lost over the past several years. You will find that for many years, staff members have wanted to challenge Bertucci for his imperial and self-interested management style, but that we feared the consequences. You will find we believe that finally, the Bertucci era of malfeasance and abuse looks like it is drawing to a close. Most importantly, you will find that we are committed to our work, but that Bertucci's actions have made a mockery out of our UN mandate: to promote improved public administration and governance, ethics and professionalism. It is a positive thing that OIOS has been called to investigate these various allegations against Bertucci. The fact remains, however, that many DESA staff do not trust OIOS. We have seen Bertucci win at the OIOS game before -- when OIOS was under its previous management. No one will feel comfortable coming forward to OIOS unless Mr. Bertucci is first removed from his position. Until that happens, staff may feel more comfortable approaching the attentive media. Perhaps you have a role to play in this unfolding story.